Match Venue : Whankhade Stadium, Mumbai. 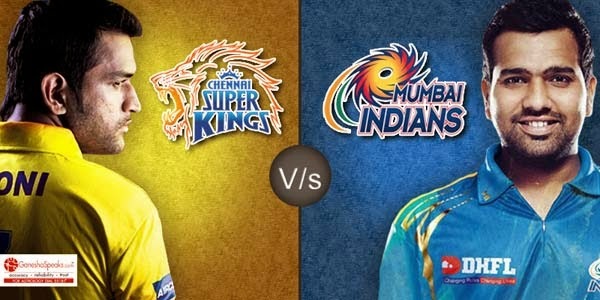 CSK will takes on MI in their territory of Mumbai. Mumbai lost their four openings games in thus season and comeback very hard later the season to reach the 2nd place. CSK have no surprise to reach the play-offs. They are the only team to qualify to the play-offs in all the editions of IPL. In this year IPL both the team won 1-1 each when playing against each other. In all time record they tie with 10-10 wins. So it’s going to be great battle of this season. They have high class international players in the side. They know how to play the big games. MS Dhoni’s captaincy will always spot on. They are having good bowling attack that can help to depend the small totals. CSK having the best fielding attack in the tournament. The firepower Brendon McCullum not available for CSK. This will definitely affect the CSK. Suresh Raina and Faf Du Plessis not in great touch. They are in and out of forms in this season. They play as a team. They are not depending on any single player for their fortunes. They are also big match players they know very well about CSK. MI playing in their home. So its going to be blue all over the stadium to cheer their team. They Playing very consistent cricket in the 2nd half of this season. Sometimes their bowlers show very ordinary stuff. They drop some important catches in the tournament. So they need to improve lot in the fielding department. Dwayne Smith, Michael Hussey , Suresh Raina, Faf Du Plessis, MS Dhoni (captain & WK), Dwayne Bravo, Pawan Negi, Ravindra Jadeja, Ravichandran Ashwin, Aashish Nehra, Ishwar Pandey. Parthiv Patel (WK), Lendl Simmons, Rohit Sharma (captain), Kieron Pollard, Ambati Rayudu, Hardik Pandya, Chuchith, Harbhajan Singh, Vinay Kumar, Mitchell McClenaghan, Lasith Malinga. Tough, really tough to predict the winner. The winning chance stands 50-50 for each side. great battle.. MI will win..